Honolulu is third-most expensive housing market among urban areas in the nation and in five other countries, according to a new survey. 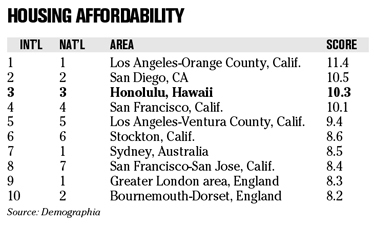 Honolulu's median multiple -- which calculates the median home price and median household income to rate affordability -- was 10.3, or severely unaffordable, according to the 2007 Demographia International Housing Affordability Survey. The survey, which rated 159 major markets in Australia, Canada, Republic of Ireland, New Zealand, United Kingdom and the United States. It was conducted in the third quarter of 2006. The results differed significantly from a recent survey by Mercer Human Resource Consulting of 143 cities worldwide. That study, which looked at more than just housing, ranked Honolulu 64th -- far below leaders Moscow, Seoul, Tokyo and Hong Kong, which weren't covered by the Demographia study. In the Demographia survey, Honolulu ranked below only Los Angeles/Orange County and San Diego. "It reflects the long-term attractiveness of this market as a place to live, and also tends to be a reflection of the difficulties of building houses either because of regulatory or environmental constraints," said Paul Brewbaker, a Bank of Hawaii economist. The national median multiple in the United States is 3.7, according to the survey, which lists affordable markets as 3.0 or less. The most affordable markets are Regina, Canada; Fort Wayne, Indiana; and Youngs-town, Ohio.